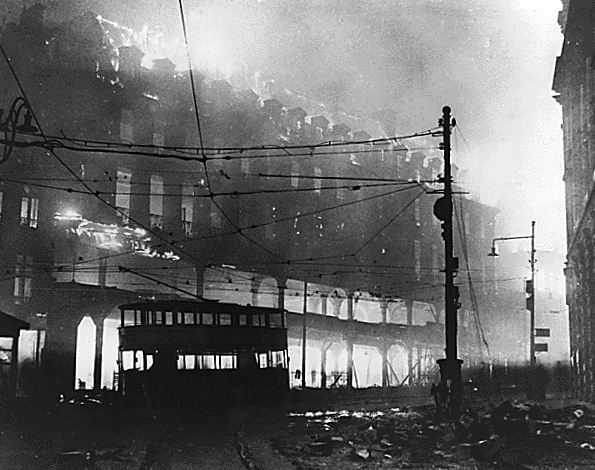 Starting with the night of 7th September, 1940, London was bombed 57 nights in the row. The Luftwaffe’s success in night operations caused a lot of concern in political circles. At the time there was practically no effective defence against night air raids and the theory of “knockout blow” against civilian population was still fresh in memory. The effects of successes of searchlight and AA units were practically negligible, while the the night fighter interception system, initiated by Dowding and based on airborne radar, was still at the experimental stage. Consequently, many aspects of night fighting operations had to be improvised during the Blitz. No story of the Battle would be complete without some account of the night operations. It is true that they constituted only a subsidiary activity in comparison with the main German objective of fighting us to a standstill by day so that air superiority might be attained as a preliminary to Invasion. The night attacks did little directly to affect the efficiency of the day fighting squadrons, though they had certain indirect effects. Although actual casualties were insignificant, disturbance and loss of sleep were caused; damage was done to factories where aircraft engines and accessories were produced; and the stress of continuous operations, day and night, imposed a very heavy strain on formation commanders and staff officers, and upon the personnel of all Operations Rooms. I had long been apprehensive of the effect of night attacks, when they should begin, and of the efficacy of our defensive measures. We relied on daytime interception methods, and on the searchlights to illuminate and hold the bombers. If they were capable of doing this, all would be well, since the distance at which an illuminated bomber can be seen by night is comparable with the range of visibility by daylight. The first night attack worthy of the name was made early in June and our results were encouraging. Aircraft were well picked up and held by the searchlights and 6 were shot down. The attack was, however, made at comparatively low altitudes (8,000-12,000 ft.) and the Germans, profiting by this lesson, resorted thereafter to greater heights at which the searchlights were practically ineffective. In close consultation with myself, General Pile tried every conceivable method of operation, but without material success. About this time radio-location instruments were fitted in Blenheims and it became necessary to develop at high pressure a system of operation which should enable night fighters to make interceptions even against unilluminated targets. The difficulty of this task will be realised when it is considered that it became necessary to put the fighter within one or two hundred yards of the enemy, and on the same course, instead of the four or five miles which were adequate against an illuminated target. It may be asked why the searchlights were so comparatively impotent when they had afforded an accessory to successful defence at the end of the last war. The answer lies partly in the height factor already discussed, and partly in the greatly increased speed of the bomber, which was about three times that obtaining in 1914. The sound locator, on which searchlights mainly relied at this time, naturally registered the apparent position of the source of sound and lagged behind the target to the extent of the time taken by sound to travel from the target to the sound locator. When the speed of the target is low it is comparatively easy to allow for this lag, but at the speeds of modern bombers the angular distance which must be allowed for in searching is so great that the searchlights were generally defeated. The first thing which appeared obvious to me was that a “sound plot” track transmitted from the Observer Corps with a variable and unpredictable lag, was good enough only for Air Raid Warning purposes and was much too inaccurate to be of use for controlled interception at night: height indications also were little better than guesswork. The radio-location apparatus (known as A.I.) fitted in twin-engined fighters had a maximum range of 2 or 3 miles, but it was limited by the height at which the Fighter was flying. If, for instance, the Fighter was flying at 10,000 feet, ground echoes were reflected from all ranges greater than this, and an aircraft echo from 10,500 feet would be indistinguishable among the ground echoes. The minimum range of the A.I. was also restricted at this time to about 1,000 feet. Below this distance the aircraft echo was swamped by instrumental disturbance. Continuous and intensive development work was in progress to minimise these limitations. No radio-location apparatus was available at this time for inland tracking, and I turned for help to the Army, which had developed for use with guns a radio-location apparatus known as the G.L. Set. Within a limited range (about 40,000 feet) this set could give very accurate position plots, and, moreover, could read height to within plus or minus 1,000 feet at average ranges. Although these sets were few in number and were urgently required for their original purpose of gun control, General -Pile realised the urgency of our need and made available about 10 sets for an experiment in the Kenley Sector on the usual line of approach of London raiders, which commonly made their landfall near Beachy Head. The G.L. sets were installed at searchlight posts, and direct telephone communication was arranged with the Kenley Sector Operations Room. Here a large blackboard was installed, and the G.L. plots were shown at intervals of about 30 seconds and with a greater accuracy in height than had before been possible by any means. The track of the pursuing fighter was determined by means of the R/T Direction Finding stations. Major A. B. Russell, O.B.E., T.A.R.O., co-operated in the development of this system in the Kenley Sector. His practical knowledge and tireless enthusiasm were of the greatest value. [As has been already mentioned, – ed.] the Blenheim was unsuitable for day-time combat with fighters, owing to its low speed and lack of manoeuvrability. It had been relegated to night duties for these reasons, and because adequate space was available in its fuselage for an extra operator and the scientific apparatus which was necessary for the development of a new night-interception technique. The cockpit had not been designed for night flying and the night view was extremely bad. Its already low performance had been further reduced by certain external fittings which were essential for the operation of the radio detecting apparatus. 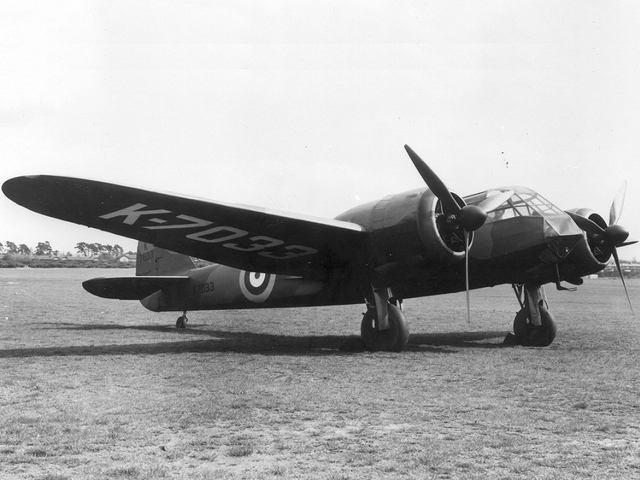 The Bristol Blenheim became the first radar-equipped night fighter of the RAF. It was badly suited for this role, suffering from lack of speed, climbing performance, poor night visibility from the cockpit and insufficient armament. A special Fighter Interception Unit was formed at RAF Tangmere in April 1940 under the command of Squadron Leader Peter Chamberlain equipped with 5 Blenheims having A.I.Mark III. The first victory was won on the night of the 22/23rd July 1940 when a Blenheim shot down a Dornier Do 17 over the Channel south of Bognor Regis. The Beaufighter was looked on as a Blenheim replacement in which most of the above disadvantages would be overcome. Its speed promised to be adequate and its armament consisted of 4 20-mm cannon instead of the 5 .303-inch Brownings of the Blenheim. There was thus hope that decisive fire could be brought to bear in the short period during which visual contact could be expected to be maintained at night. Like the Blenheim, it had not been designed as a night fighter, being in itself an adaptation of the Beaufort torpedo bomber, and the night view from the cockpit was bad; but Air Vice-Marshal Sir Q. Brand, K.B.E., D.S.O., M.C., D.F.C., a veteran night fighter of the previous war, had designed a new cockpit layout, which did not, unfortunately, materialise during my tenure of the Fighter Command. The output of Beaufighters was also very low. Another-type which was pressed into service as a Night Fighter was the Douglas DB-7, now the Havoc. It had low fire power and comparatively poor performance with its original engines. Its chief advantage lay in its tricycle undercarriage, which proved very popular for landings in bad visibility. Only one Squadron of these was in being when I left the Command. Promising results were obtained almost from the first and numerous instances occurred where echoes were obtained on the A.I. sets in the aircraft. Practical results were, however,. disappointing, partly because the A.I. apparatus proved to be unexpectedly capricious in azimuth, and partly because the Blenheim was slower than many of the German bombers and was deficient in firepower. Many Germans escaped after an initial A.I. “pickup” and even after visual contact had been effected. The A.I. apparatus was then fitted into the Beaufighters, which were just beginning to appear in service. The machines and their engines suffered from teething troubles to an unusual degree, and the adoption of A.I. to a new type was accompanied by certain difficulties. In addition, they were operating from a wet aerodrome at Redhill, and the development of delicate electrical apparatus, combined with a new type of aircraft and engine, with rudimentary maintenance facilities, was a matter of the greatest difficulty. In nine cases out of ten something would go wrong with the aeroplane or with the A.I. set or with the R/T Direction Finding apparatus or with the communication system before an interception could be made. No. 219 Squadron, under Squadron Leader J. H. Little, were engaged in this work and operated with great energy and enthusiasm under extremely adverse and difficult conditions. It would, of course, have been desirable to carry out all this development work by day when faults would have been much more easily detected and remedied, but the low rate of aircraft serviceability precluded day-and-night work, and London was being bombed almost every night, so that I could not afford to neglect the chance of getting practical results. These, though disappointing, were not entirely negligible; several bombers were shot down in this area during the experimental period, and many discovered that they were pursued and turned back before reaching their objectives. Night fighting development work was also going on at the same time at the Fighter Interception Unit at Tangmere in Sussex. A supplementary use was found for the A.I. by the installation of A.I. “Beacons” in the vicinity of Night Flying Aerodromes. These afforded a valuable navigational aid for homing in cases where any defect occurred in the R/T D/F system. Shortly before I left the Command a new piece of radio-location apparatus became available in the shape of the G.C.I. set with the plan position indicator. This was an inland-reading set which showed the position of all aircraft within its range on a fluorescent screen as the aerial was rotated. The main advantages of this set were that it had a longer range than the G.L. set and it was possible to track the Bomber and the Fighter by the same apparatus instead of following one with the G.L. and the other by R/T D/F. Moreover it was found that in some circumstances the accuracy of the R/T D/F method was inadequate for night interceptions. On the other hand, the accuracy of height readings by the G.C.I, apparatus was less than that obtainable with the G.L. I understand that this has now been improved. Whatever the exact technical method of plotting positions and tracks of aircraft, the object was to place the fighter behind the bomber, and in such a position that the echo of the latter would show in the fighter’s A.I. set. The fighter then tried to overtake the bomber until it became visible to the naked eye. At that time only multi-seaters could be fitted with A.I., and therefore, concurrently with the night interception experiments, methods were tried of using the searchlights as pointers for night fighters, even if the target were out of range of the searchlight beam. Experiments were made with the searchlights in “clumps” to increase their illuminating power and the visibility of their beams to fighters at a distance. A small radio-location set was designed to fit to the searchlight itself, so as to get over the time-lag which was such an insuperable obstacle to the use of sound locators. It is probable that if searchlights can substitute the speed of light for that of sound they may take on a new lease of useful life. The disadvantage of relying entirely on radio-controlled methods of night interception is that saturation point is quickly reached, and when mass raids are in progress only a limited number of fighters can be operated. Results obtained in the Spring of 1941 show that day fighters can obtain important results in conditions of good visibility, especially if attention is paid to all methods of improving the night vision of pilots. During the Battle the “Intruder” system was initiated on a small scale. Night fighters without A.I. were sent across to France in an attempt to catch Bombers while taking off from, or landing at their aerodromes; or to intercept them at points where they habitually crossed the French Coast. I had to leave the development of night interception at a very interesting stage; but it is perhaps not too much to say that, although much remained to be done, the back of the problem had been broken. The experiments had, of course, been carried out in a small area, and raiders which avoided the area could be intercepted only by previously existing methods; but the possibilities had been demonstrated and could be applied on a larger scale as soon as the necessary apparatus was provided. The method is, of course, also applicable to the day interception of raiders making use of cloud cover, which have hitherto proved extremely elusive; and it is not too much to hope, that the eventual development of very high-frequency A.I. may enable accurate fire to be opened against unseen targets, so that not even the darkest night nor the densest cloud will serve as a protection to the raider. The day may come when every single-seater fighter is fitted with A.I., but this is not yet feasible. What can be done is to fit all searchlights with radio-location apparatus so that every searchlight beam is a reliable pointer towards an enemy, even if the range is too great for direct illumination (as a result of the experience gained during this period, all searchlight equipments have since been fitted with radar control, this, combined with intensified training, has made them, since 1941, extremely accurate). If then the fighter can be informed in addition of the height of the raider, day fighters will be able to join usefully and economically in night operations on dark nights.